I have such great memories of growing up. I was an only child, which meant I didn't have a lot of distractions at home. There wasn't a lot of chaos and children running around - it was just me. I realize you don't miss what you don't have and I didn't yearn for siblings. I had lots of friends and cousins (and tons of books - you could find me under a tree or hiding in my closet reading) and my life felt bursting at the seams full. I also spent a lot of time in the kitchen watching my Mom cook amazing meals. She was always focused on creating healthy, yet tasty meals. She introduced me to the Farmer's market, farm to table eating and how to pick the best produce. I have always admired her sense of style - from how to dress a beautiful table, to how to throw a successful dinner party, to picking the perfect dress to wear and how to apply beautiful eye makeup (as a former model and make up artist - she was the epitome of style)... my Mom has taught me so much. One dish that my Mom has made every single year since I was a little girl is this colorful cranberry salad. I can't remember a time from November through January that we haven't had this salad on our holiday table. Last year as my Mom and I were making this salad together, I wondered out loud if I should share the recipe on the blog. The thought quickly went away through the haze of holiday activity. This year it entered my mind again and my Mom has graciously allowed me to share it with you guys. 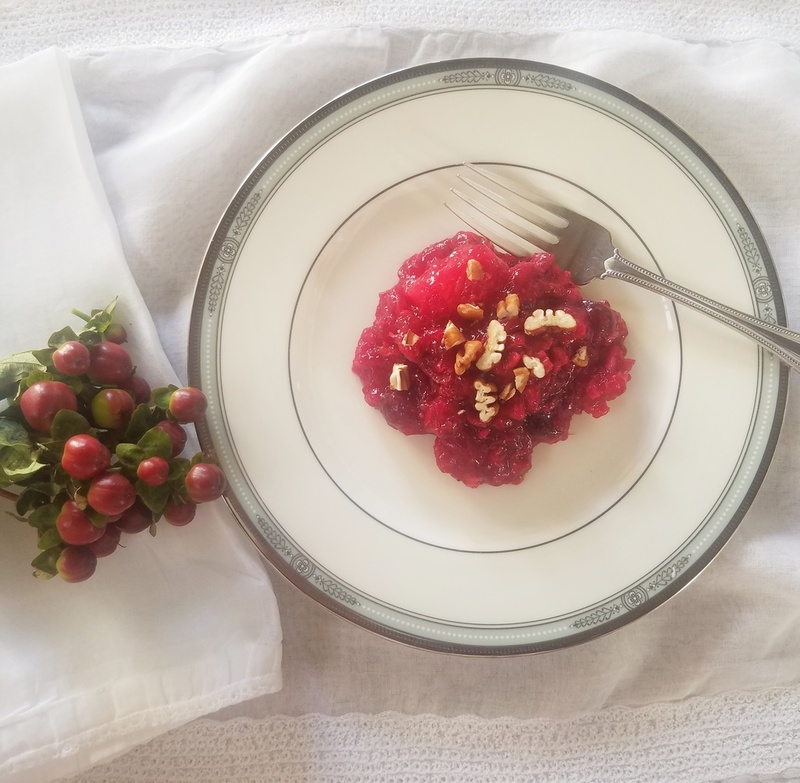 What I love so much about this dish, is the beautiful pop of color it brings to a holiday or winter meal, it's relatively healthy (except for one cup of white sugar), it's so easy to prepare and it tastes delicious! We always have to make more then one, as my kids (actually all of us!) fight over who gets the last scoop. Complete the chopping first. Dice the apple, orange, including peeling the outer layer of the orange and dice the skin + pecans and set aside. Rinse the fresh cranberries in a colander. 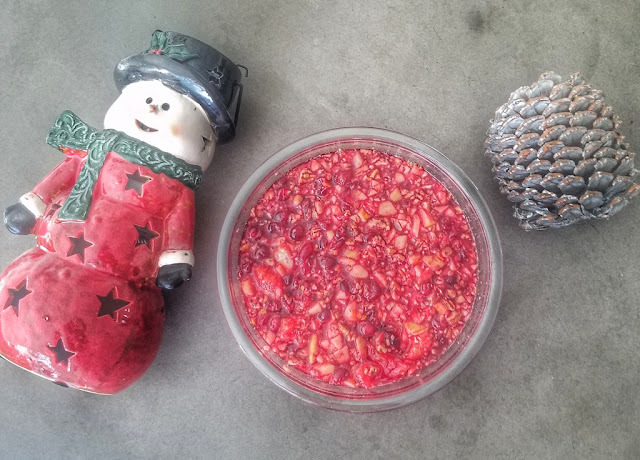 Then, in a medium sized saucepan, combine the cranberries with 1 cup of water and 1 cup of white sugar. Bring to a boil, then simmer uncovered until the cranberries completely burst open - about ten minutes. In a small bowl, combine one packet of Knox gelatine with 1/4 cup of hot water. Stir to dissolve. In another small bowl, combine the black cherry jello with 1 cup of hot water and 3/4 cups of cold water and set aside. 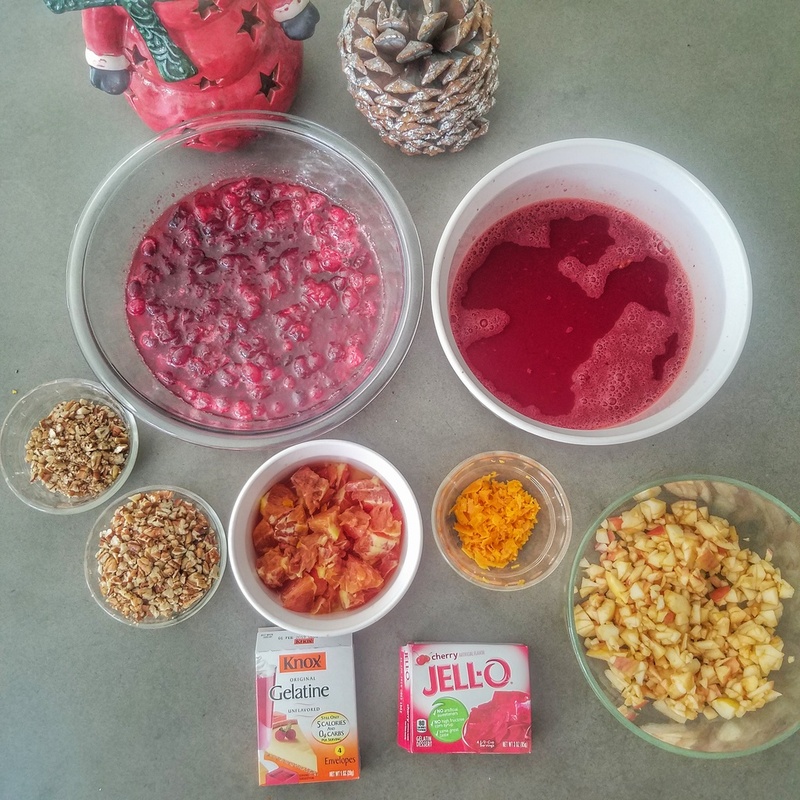 In a medium sized serving bowl, combine the Knox gelatine mixture, cherry jello mixture, simmered cranberries, fruit + orange zest and pecans. Gently stir until all combined. This salad is wonderful alone - and it's also delicious with any type of meat (not just turkey), or scoop a spoonful alongside a huge green salad. You can even have it for breakfast with a hard boiled egg - there are so many ways to enjoy! Okay, now I'm off to make this again as my mouth is watering. Happy eating and running my friends.